For most people their first giant encounter was most likely with David and Goliath, Jack and the Beanstalk, or some other bed time story. For me it was different. I am told that my great grandfather was seven feet tall or more and could grab people by their head with one hand his finger tips resting on their eyebrows his palm on the base of their skull, he would guide them as he pleased. My mother reports that his ears were between six and seven inches from top to bottom. I was told how he had a horse that was six feet high at the back and he could be seen over the saddle from the shoulders up. That’s a big man. The interesting thing is, through my life from grade school to adulthood, I have met with different people who could not believe the story of my great grandfather’s size. From polite people who I could feel thought I was telling tall tales, (Pun intended.) to people who flat out called me a liar or an idiot. This compelled me to do a lot of giant research in my teens. 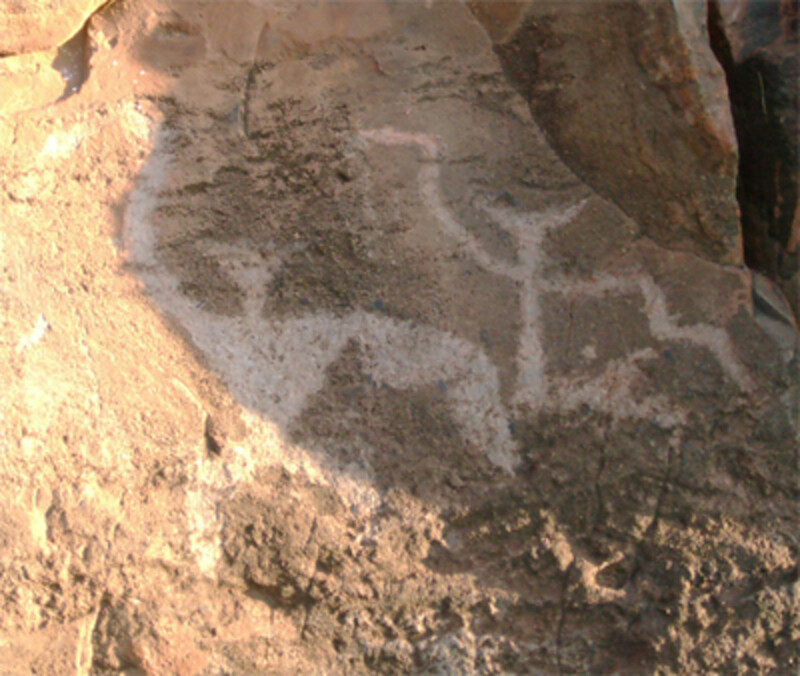 Growing up in Nevada I had heard stories of the Sitecah from the Paiute Indians that lived in the area. They told of red-haired men and women of light colored skin as tall as 12 feet who originally lived in the area when the Paiutes had first arrived. Evidently these human giants liked to eat the Indians so they had problems making friends. The Indian tribes of the area finally joined and ambushed the giants killing most of them on the spot. The remaining giants took refuge in a cave. The Indians demanded they come out and fight but the giants refused. So, the Indians piled brush into the cave and set it on fire. Any giants that did run out were shot with arrows, the remaining giants were asphyxiated. In the 1800s this cave was known as Horse Shoe Cave but is now called Lovelock Cave. Lovelock cave is located around 20 miles South of Lovelock Nevada. In 1911 bat guano harvesters started working in this same cave. After digging out four feet of guano they found many broken arrows that the Indians had fired into the cave as well as other interesting artifacts, and yes, they found red-haired giants. Even in the shrunken mummified condition the skeletons ranged in height from 8 feet to just under 12 feet. I did an internet search on this subject and found that the reported heights are very different from what I am stating here. (Internet says 6.5 feet to 8 feet.) My account is from what I was told growing up in Nevada. 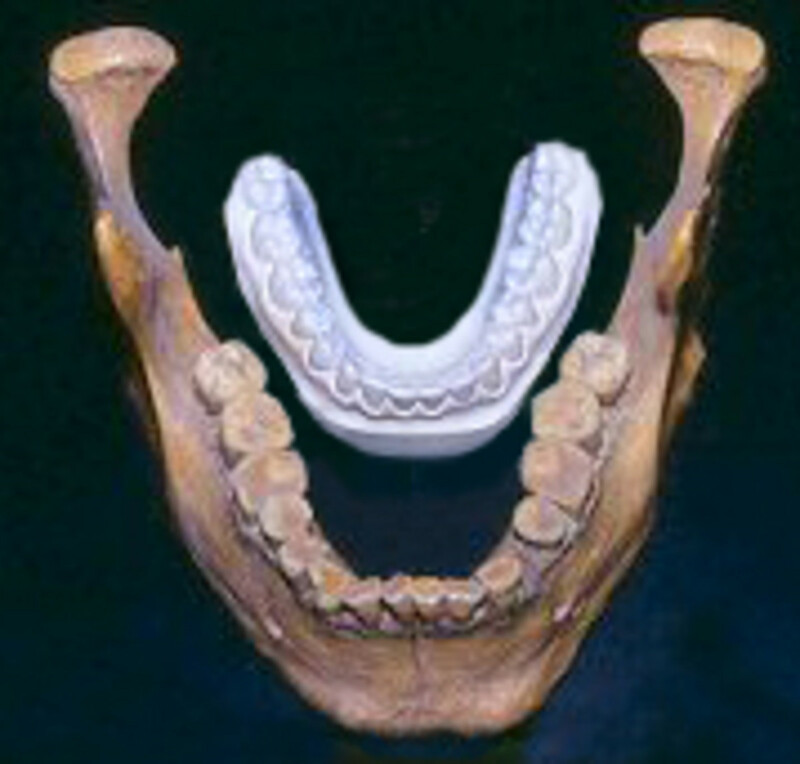 I will leave it up to you to decide on the heights based on the photo of one of the cave giant’s jaw bone and dental cast of a regular man’s teeth. Most of the artifacts have been lost over time due to lack of interest from science. Go figure. However some of the artifacts are in the Humboldt Museum at Winnemucca Nevada and in the Nevada State Historical Society’s museum at Reno. In 1877 prospectors outside of Eureka Nevada found a human leg broken off four inches above the knee cap including the foot. This leg was found sticking out of solid red quartzite rock dating from the time of the dinosaurs. After using their picks to extract their find from the rock they took it to Eureka. Medical doctors examined the bones and stated that it did indeed belong to a human of very modern appearance. The interesting part was the size of the bones. They measured from heel to knee 39 inches. The owner would have stood over 12 feet tall. The area was searched for more remains but nothing else was found. This story was heavily published in the newspapers of the time. For over 20 years now I have been living in the islands of Hawaii. Only a few years after I had first moved here I again heard about red-haired giants. 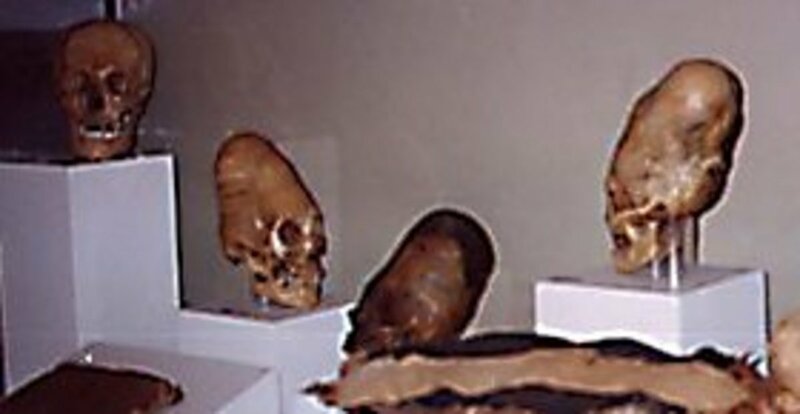 Two giant 10 and 12 foot red-haired skeletons were found in a lava cave in a canyon behind Olowalu Hawaii. I drove out to Olowalu to see what I could find out. After making my way off the main road onto the old road. I turned up the canyon in which I had been told the research was happening. After a little exploring I found some excellent though strange petroglyphs on the side of a rock out cropping. I was just able to take a few pictures before a white SUV drove up with a man and a woman in it. The woman was driving. The woman told me that I would have to leave the area. After talking with her for a few minutes she admitted that Red-haired skeletons had been found and that they were much larger than they should be. She would not tell me any exact measurements. She did say that they did not want to upset the Hawaiians with their discoveries. The man never spoke even when I greeted him. It should be noted that although there is the spirit of Pele that is the Goddess of fire believed to live in the volcano. Pele started out as a physical Pele that traveled the islands. She is described as extremely tall with fiery red hair, fair skin, great strength, incredible beauty, veracious sexual appetite and a deadly temper. It is mentioned that Pele’s father is the man-eater Ku-waha-ilo who dwells in the far off heavens. Pele traveled the islands of Hawaii digging underground tunnels in an effort to find a spot that she could dig deep caves that did not flood with water so she could make a safe home for her family. Several days after meeting the man and woman in the SUV, I went back at night. More than anything I wanted to see exactly where the discovery was. This time I took a sugar cane road in from another direction. I four wheeled it in so that I would be on the ridge above the canyon on top of the rock outcropping with the petroglyphs. I was not there very long before headlights came on below me and started working their way to me. I knew I could be gone before they could get to me but I figured I just as well go meet them. It turned out to be a local guy who was hired as security to guard the site. He told me that Yes, two giants were found. A man and a woman, the big one was easily 12 feet. He did not like staying all night in the canyon it gave him the willies. I kept him company for a while and he told me where the cave was. Not that it mattered they covered it completely when they were done. Even now the area where I had driven my truck on the ridge to look into the canyon is a housing development. Recently I took a trip to Peru and guess what jumped out at me in some of the museums I visited there? 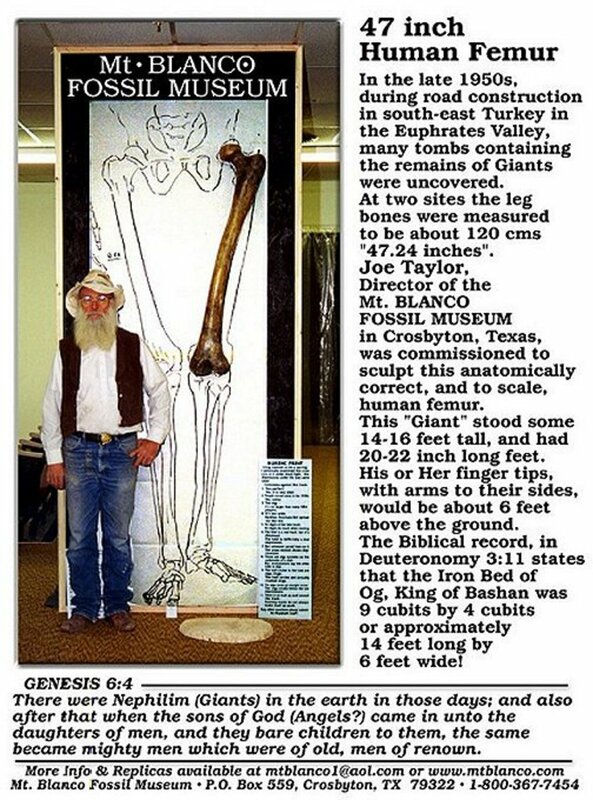 Yes, it was giants. In Peru they are not whisked away like they are in the USA. (It should be noted that there have been hundreds of giant discoveries in the USA that have been either ignored or taken into custody by the Smithsonian never to be seen again.) The Incas actually had kings that were giants and had red and blond hair. In the Gold Museum in Lima you can still see the clothing and head of an Incan king who stood an easy 10 feet tall. His golden robe is 8 feet long and did not touch the ground when he wore it. His gold gloves are twice as long as my hands. His dried and mummified head is easily twice the size of mine and I’m not a little person. There are two giants and their belongings in the Gold Museum in Lima Peru. Everywhere you go in Peru there are giant skulls and skeletons. Many of the skulls are not normal looking either, and they are not all thousands of years old. In most cases we are talking hundreds of years. I think it is interesting to compare the Peruvian skulls to the Egyptian busts especially when you think they both built massive structures of stone that we can’t explain. Does it prove anything? No, just interesting. Now, before you start yelling about head binding and Indian cradle boards. You should know that head binding and cradle boarding can change the shape of a skull but it cannot change the capacity of a skull. The skulls shown above and to the right have from two to two and a half times the brain capacity of a normal skull. Sort of like an ounce of clay. You can mash it around all you want but it will never be two ounces of clay. I have tried to keep this within the realm of my own experiences. There is so much more to this. Like the 64 pound sledge hammer found in a 3500 year old copper mine near the town of Llandudno in North Wales. Giant axes unearthed in Iran, Giant swords, etc.You could read for weeks on the subject of giants and if your mind is anything like mine enjoy every minute of it. I would suggest googeling Solomon Island giants, red haired giants, Arizona giants, California giants, Ohio giants, Peruvian giants. 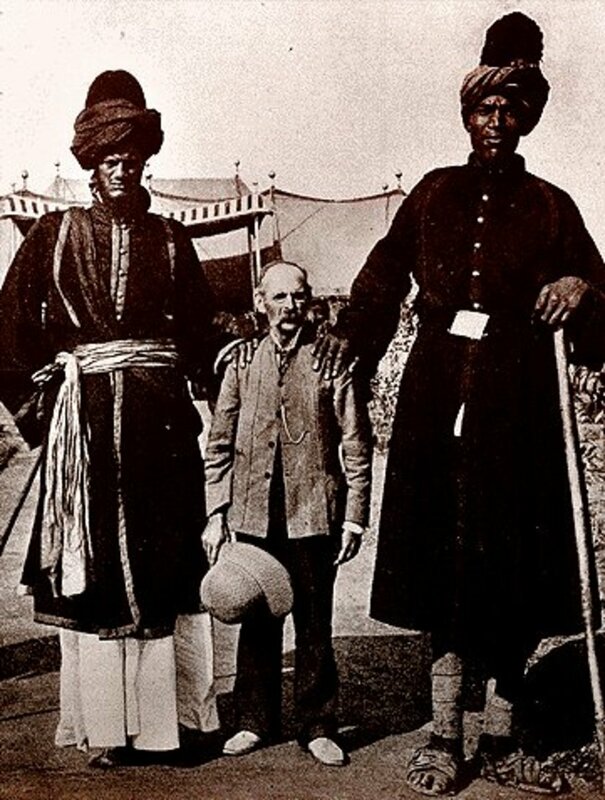 I could go on forever about giants but the fact is Science says that races of giant humans do not exist and never have. 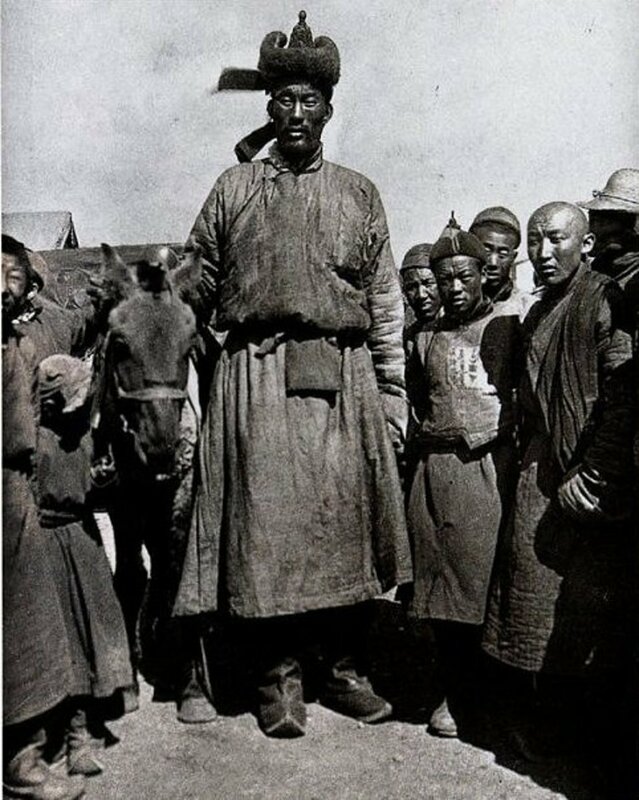 Roy Chapman Andrews took this photograph of 7 foot five inch man in 1922 in Ulaanbaatar. The photograph was never published in the magazine.